ODM has a fantastic history and reputation in designing and manufacturing the best marketing items in the industry. One of our specialties is the bottle glorifier. This item does wonders in illuminating your product and highlighting your brand. This is the ideal solution to increase sales and put your product on a marketing platform for all to see. Hennessy have used a custom bottle glorifier to create a luxury look to their product! Check out this blog to learn more. This bottle glorifier model is great in highlighting and protecting your product, so click the image to learn more! 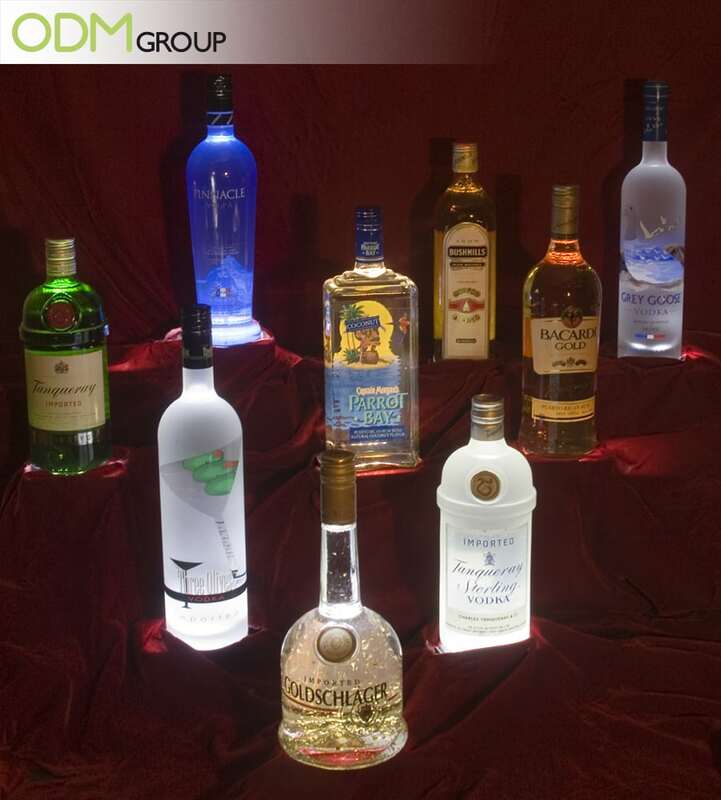 We are very impressed by this Bottle glorifier design made from LED and wood. This gives the product a classic look whilst giving the brand a head-start to attracting customers from competing brands. Click below to see how Glenlivet did it. This champagne bottle glorifier is great because its simple and fits well with the use of the product. It doesn’t draw attention away from the menu’s but does emphasise the product well. This idea will wow your customers! Creativity is key when it comes to using a bottle light glorifier. Click on the blog below to learn more. Your brand could be just a bottle glorifier away from the level of success that the brands shown above achieved! 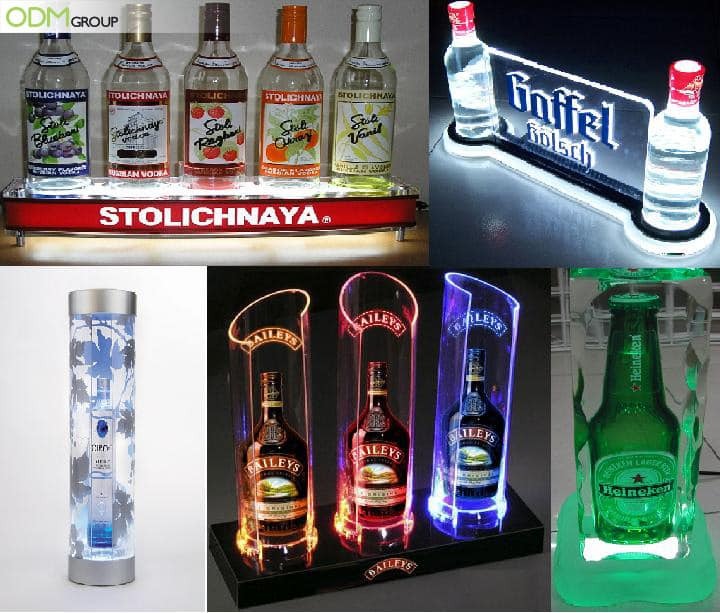 Bottle glorifiers are great tools to capture the attention of patrons at clubs, bars and restaurants. This is because bottle glorifiers display spirits and beers in the most attractive manner to capture the mood and image of the individual drinks. They are also a great wine bottle illuminator. They are used to display a strong on site advertisement. A good display will result in greatly increased sales. Nowadays, bottle glorifiers are very popular promotional products. Colour is one of the most basic branding requirements and we are able to match the pantones of the drink we are promoting. This Carlsberg bottle definitely exemplifies quality and class due to the use of multiple high end materials. Lighting or Sound can also be integrated to improve the overall outlook of the display. Some bottle glorifiers contain more than one bottle showcasing the depth of the brand. This is to promote a wide range of alcoholic beverages. We can also arrange for this kind of POS to be adapted for tastings across the range of tastes or vintages of the product.A bottle glorifier or POS display is exceptionally useful for wine and whiskey tastings. 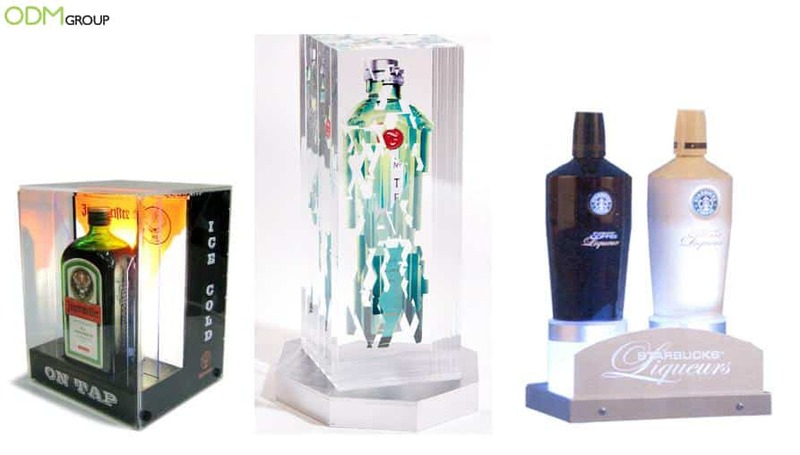 Our designers can make a whole range of bottle glorifiers with unique and funky designs to enhance the promotional impact on clients. Take for instance the Heineken bottle which is enclosed in an iceberg-like bottle glorifier. This sends out to consumers the message that beer served here will appeal to you. The ODM group is always looking to design and manufacture new POS displays and glorifiers. Our service spans from the conceptualisation & brainstorming to design, mould development, manufacture, quality control, testing and shipment. Our team of graphic and industrial designers are based in China and have a lot of experience with choosing the right kind of materials and finding the best technical solutions to showcase your brand. So place an inquiry with us today so our services can provide you with your promotional needs! Wanna see a bottle light glorifier in action? Then Check out this Bottle Glorifier video below! Need some excitement in your restaurant or bar? Then check out this blog on 100 products to spice up your merchandising! This idea will glorify your liquor on a whole other level. Using stand out promo cradle designs are a great way of exceeding customer expectations. So If you’re interesting in doing just that, then read this blog below! At ODM we cater to all liquor merchandising needs. This includes designing and manufacturing promo products such as bottle stoppers. So If your interested in creating custom branded bottle stoppers, then read this blog below!